The Licenced Jubilee Bar is available to pre-booked functions. 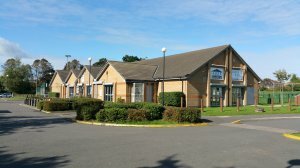 There is a large car park to accommodate x60 cars; The outdoor patio overlooks the sports fields, which include a senior football pitch and a number of junior football pitches and cricket pitch. The changing rooms/shower facilities are also available for hire. The outdoor Multi Use Games Area (MUGA) is available for hire by arrangement.